For a complete list of 2017-18 ASF grantees, click on image. The Foundation annually awards a Grant to each of the School Buildings to be directed toward special programming and activities as determined by the Building level administrators. These grants support special projects and initiatives which have been defined by a donor or groups of donors and endorsed by the Foundation Board of Trustees. Designated Grants may also be initiated by the Foundation Board of Trustees. The Foundation consistently supports special student-centered activities and programs which may or may not be supported by our other grant initiatives. Requests for these grants may be submitted by individuals or groups from within or out of the school community and will be considered on a case by case basis. Any individual or group seeking consideration for a Special Grant or interested in the criteria or application process should contact the ASF Grant Committee at info@auroraschoolsfoundation.org or 330-998-2185. If you are passionate about the Aurora Public Schools and would like to use your talent to help students achieve lifelong success, we invite you to volunteer for a board position. Please contact the Foundation office if you would like to learn more about our board. We have a variety of programs to support teachers and help students succeed. You can make a difference by getting involved. Make a donation to the Aurora Schools Foundation and help to support our ongoing work. 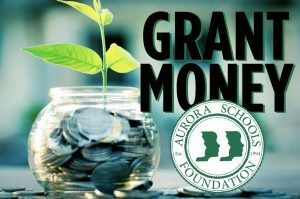 The Aurora Schools Foundation is a non-profit, charitable, 501(c)(3) organization dedicated to supporting the educational programs of the Aurora City Schools. The Aurora Schools Foundation will promote excellence in the youth of Aurora by supporting and enhancing the educational programs of the Aurora City Schools.